"Basic self-catering apartments in a top resort. 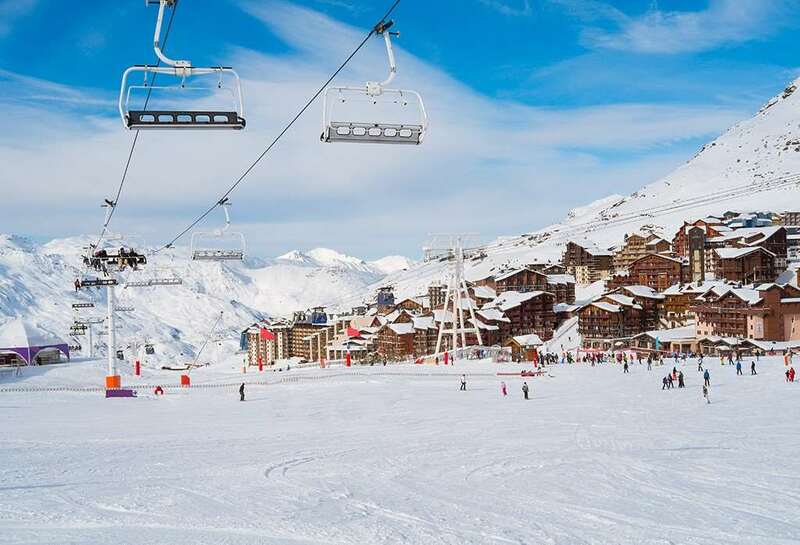 Val Thorens is famous for après ski and nightlife, so these apartments are ideal for groups who want to hit the party and the powder in equal measure." Free Wi-Fi area at reception. Studio (B3) 22m² - sleeps 2-3 Living room with single sofa bed, pull-out bed and pull-down bed. Studio & cabin (C4) 21m² - sleeps 2-4 Living room with single sofa bed and pull-out bed, cabin room with bunk beds. 2-room Apartment (E4) 25m² - sleeps 2-4 Living room with single sofa bed and pull-out bed and double bed on mezzanine or in separate bedroom. 2-room Apartment (F6) 32m²- sleeps 4-6 Living room with single sofa bed and pull-out bed, double bedroom and cabin room with bunk beds. All apartments have kitchenette with hotplates, oven, fridge and dishwasher, bathroom, satellite TV (pay locally €41 per week) and balcony. Local Expenses Refundable deposit €250 (credit card). Towels €7.50 per set (optional) Resort Taxes. We had fun - we had lots of fun. As a family of three, one of whom had never been skiing before, this was a great holiday. It had its downsides, the time spent travelling was a chore, the accommodation was pretty basic, but when we got there and got on the slopes, it was well worth the effort. We were only 50m from the slopes, within crawling distance of most of the lifts and there was snow, plenty of it. In the morning a bit icy, but by lunch time the thaw had set in and we headed off in the afternoon higher up. Some gloriously long runs to do, Moraine was great nearly 7Km of skiing before you hit the bottom. Wider than a wide thing, there didn't seem to be any need for piste markers because the run seemed to take up the whole valley. Some of the reds were challenging for us intermediates; one of the Portette runs on the last day was very, very windy and icy, but also scary and exciting. My daughter (age 11) loved it and was like a duck to water. My wife (a first timer) was at the end of the week skiing down some of the blues. The instruction she received was excellent, considering her lack of confidence at the beginning of the week. There were plenty of runs to do, although we repeated several, we had plenty to explore. The views from the top, some were to die for. Most evenings we spent just cooking and eating, with a little occasional wine, giggling and laughing at our aches and pains. Sam our rep was great. He called in several times to make sure that everything was going smoothly. When my wife had a problem with her tuition, he re-arranged her lessons and got her an additional afternoon slot. After that she just grew in confidence and ability. Any questions we had, Sam sorted! And to cap it all, at the end of the week upon arriving home, I had dropped 2 kilos in weight - bonus!!! The Olympiades Apartments were basic but I thought pretty good value for what we paid. We had a 4-person apartment, with a good-sized bathroom with great shower (although it did flood the floor! ), a wee kitchen area with kettle and two hobs and a microwave and plenty of crockery/cutlery, tiny room with bunk-beds but loads of clever storage space, sitting area with dining table that folded down, sofa-bed and again loads of storage space, plus a small balcony. If you want privacy or space to swing a cat, these are probably not the apartments for you, but they were clean and comfortable. There was a boot room in the basement with lockers to store skis. There was half an hour of free wireless internet per day. It was really convenient for the slopes and we could ski back pretty much to the front door in the evenings. There was a ski-hire shop opposite and a good little supermarket next door. We didn't find it noisy unlike some previous reports. Val Thorens was a good resort with plenty of intermediate skiing and good snow though some of the south-facing slopes were getting a bit slushy in places at the end of the week (we did have glorious sunshine every day). We went over to Courchevel - great skiing, Meribel was a bit crowded. Some of the mountain restaurants were very expensive, but there were some that were better value. All in all, a very good week's skiing.